This southern part of the Woodstock Road was originally known as St Giles’ Road, and the southern part of the Banbury Road was Park Place. These names were later changed respectively to St Giles’ Road West and St Giles’ Road East. 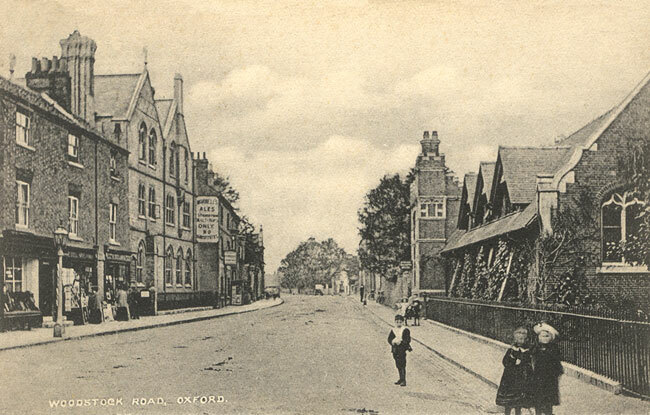 When, however, the area between Summertown and Oxford became developed, the southern parts of the two roads took the same name as the northern part, and were renumbered. The above photograph was taken in about 1905. On the left is the Waggon & Horses at 25 Woodstock Road.